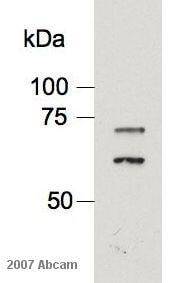 This antibody reacts with both recombinant and native Lamin A and C in humans. Recombinant fragment corresponding to Human Lamin A + C.
This product has been shown to bind to an epitope between amino acids 464-572. Our Abpromise guarantee covers the use of ab40567 in the following tested applications. WB 1/200. Predicted molecular weight: 74 kDa. Overlay histogram showing HeLa cells stained with ab40567 (red line). The cells were fixed with 80% methanol (5 min) and then permeabilized with 0.1% PBS-Tween for 20 min. The cells were then incubated in 1x PBS / 10% normal goat serum / 0.3M glycine to block non-specific protein-protein interactions followed by the antibody (ab40567, 1/10 dilution) for 30 min at 22°C. The secondary antibody used was DyLight® 488 goat anti-mouse IgG (H+L) (ab96879) at 1/500 dilution for 30 min at 22°C. Isotype control antibody (black line) was mouse IgG1 [ICIGG1](ab91353, 2µg/1x106 cells) used under the same conditions. Acquisition of >5,000 events was performed. Immunohistochemistry (Formalin/PFA-fixed paraffin-embedded sections) analysis of human colon tissue sections labelling Lamin A + C with ab40567. Immunocytochemistry/ Immunofluorescence - Anti-Lamin A + C antibody [JOL2] (ab40567)Image courtesy of Nir Drayman by Abreview. ab40567 staining Lamin A + C in HeLa cells by Immunocytochemistry/ Immunofluorescence. Cells were fixed in 100% methanol, blocked with 5% serum for 30 minutes at 22°C and then incubated with ab40567 at a 1/100 dilution for 1 hour 30 minutes at 22°C. 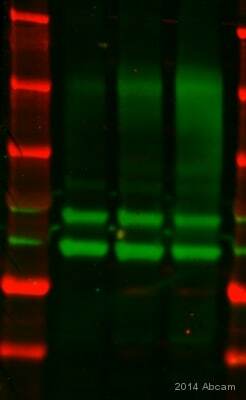 The secondary used was ab98795, donkey anti-mouse IgG - H&L (DyLight® 550), pre-adsorbed, used at a 1/200 dilution. DAPI was used to counterstain nuclei. ab40567 staining Lamin A + C in African Green Monkey CV1 cells by Immunocytochemistry/ Immunofluorescence. Formalin-fixed, paraffin-embedded human skin tissue stained for Lamin A + C using ab40567 in immunohistochemical analysis. Publishing research using ab40567? Please let us know so that we can cite the reference in this datasheet. Do you know of a reference that used this for IP? Here is a link to a reference that used the antibody for IP. I hope this helps. Please let us know if you have any questions. Mouse IgG Dynabeads (Dynal Biotech, Oslo, Norway) were coupled to lamin A/C or LAP2α-specific antibody by incubation for 12 h at 4°C in the presence of 1% bovine serum albumin. Asynchronously growing cells were extracted with hypotonic solution containing 10 mM KCl, 10 mM HEPES-KOH, pH 7.4, 1.5 mM MgCl2, 0.1% Triton X-100, 0.5 mM DTT, and protease inhibitors. After a 10-min incubation at 4°C, nuclei were isolated with homogenization and samples were centrifuged for 5 min in Eppendorf microcentrifuge. Nuclei were extracted with buffer containing 0.5 M NaCl and samples were centrifuged for 5 min at 13,000 rpm. Soluble fractions after dialysis to PBS/0.1% Triton X-100 were processed for immunoprecipitation by using LAP2α and lamin A/C-specific antibody coupled to 100 μl of mouse IgG Dynabeads. After 2-h incubation at 4°C, beads were washed with PBS/0.1%Triton X-100 (3 × 5 volumes) and prepared for gel electrophoresis and immunoblotting. My laboratory is interested in the anti-lamin A/C antibody monoclonal JOL2 for IHC processing of paraffin embedded tissue sections. It appears that Abcam offers two products (#106708 and #40567). Other than the sample images provided, I cannot see any difference between the products based on their description. Could you please clarify? You are correct to wonder about the differences between these two products. They are the same antibody clone, JOL2, and the products differ mainly in the formulation: ab40567 has sodium azide as a preservative, and ab106708 has no preservative, which is required for some live-cell applications as the azide can be toxic. The other differences are that ab40567 has been tested in more applications, has been published several times, and has been reviewed by several customers, whose feedback appears on the datasheet. It has been in the catalogue longer, which accounts for the greater number of references and reviews. Finally, the unit sizes differ: 2 ml versus 50 ul. For IHC of paraffin-embedded tissue, I recommend ab40567, at a dilution of 1/100.